A badminton racket is considered to be the best when it brings comfort and success to the owner. When badminton is becoming popular all over the world, every player wants to have the best badminton racket, which supports them to reach success. If you are also looking for some great badminton racquets, take a further look in the guide below. Here is a guide to buying the best badminton rackets built in 2019 for all badminton players. First, looking at the review of the top 10 badminton rackets, which is the most chosen today. This is a racquet which features the graphite and carbon fiber. These materials enhance the stability performance and help to increase the durability of the product. Senston N80 has 5U weight, G4 grip size, 295iA 3 MM balance point and a length of 675 MM. It measures 18 to 26 lbs and a head shape frame of the isometric square and a nanometer material which supports high pounds. The frame of this model does not easily change so that gives you the best sense of strength. It also has nine favorite colors that fit to every players and come with a high-quality cover which protects the racket and makes it easy to carry. This is the racquet I like the most in the top 10! You will feel worthy of it to spend the money on! The Carlton Aeroblade 6000 is an ideal lightweight racket for players who are just starting out. It’s also a bit shorter compared to a full-length racket, at 66 cm. The head is an isometric shape to make a larger sweet spot. A bigger sweet spot means more accurate and power to your hits as a beginner. The shaft is made of graphite for strength and sturdiness. The frame is titanium making it not only strong but also highly durable. The weight of this racket is well distributed for powerful smashes. This is also a racquet that makes you happy with its price! Astros 77 is rated as strong and hard. It has an extended graphite shaft to produce more swing and more power smash. The shaft is also weighted with tungsten, this helps create momentum for swing. Featuring Yonex’s rotational generator technology, Astros 77 will quickly respond to different hits of opponents like a smash, a net shot or a drive. It also means power smashes for you all through a game. It comes pre-strung with high tension strings. The Yonex Astros 77 is ideal if you already have some bit of experience playing badminton or are already a professional. This is a high-level racquet! Yonex B-350 features the oval head and a lightweight alloy. It weighs about 100g. This racquet is ideal for people who like recreational activities during their leisure time. Though it seems somehow cheap, it is designated for friends and families who want to enjoy the badminton game. It is made with two-piece steel shaft which makes it suitable all age groups and the ones who go through economic selection for YMCA, PE classes and the parents who want to teach their children how to play. Always go for this product for the excellent gym class and has excellent durability. The racket is really good, perfect for beginners! This model features the high repulsion power which is good for quick attacks. It features Hi-flex, graphite frame and NANOMESH nanotube graphite shaft. Yonex NANORAY 20 weighs 3U 19-24 lbs and 3U G5 grip size. It has X-Fullerene bonding the carbon fibers which helps to create cross-link construction. Yonex also has a grommet system which helps to improve the stringing performance and durability. Muscle power helps to eliminate fatigue and stress-load. This model also has a high elasticity which is always needed to create a powerful rebound effect and high structural strength. It has a square head which equalizes cross strings and the length of the main in the string bed which helps to enlarge the sweet spot. Thus, it leads to an increase the accuracy consistency. This racquet also has a layer of graphite frame which is mounted deeply with the shaft. This is the most powerful racquet of the Nanoray! The features of the Yonex B-5000 make it the ideal racket to buy if playing for fun or for use in badminton classes. The shaft is steel-made, making it stiff and strong. The frame is aluminum-covered and light-weight for the easy swing. You will find this model excellent if you’re starting out and looking for a racket that’s strong but not too heavy. The Yonex B-5000 comes pre-strung, along with tight and quality strings that will last for long. The head is the standard oval shape making it just the racquet to have if you’re new to the badminton. Weighing just 100 grams and with a synthetic leather handle for more grip, the Yonex B-5000 can be used by almost anyone as it doesn’t require any skill or strength. Good! An ideal investment for beginners! This is one of the best rackets which is perfect for beginners. It is fully equipped with a tri-voltage system which helps to improve the performance of the racquet. It has a graphite-tungsten frame, graphite shaft, 4U weight, G5 grip size, and 675mm length. Yonex Voltric Lite is made with power boost cap which helps to combine the soft and hard materials which maximize the bending power of the shaft. It also has the built-in joint which is mounted deep into the graphite layers connecting the shaft. This feature creates a high-quality and durable torque-free frame. This racquet is very good for newbies that helps them to quickly improve their skills! This carbonate series features the graphite shaft and the carbon nanotube frame. The elastic Ti of this frame helps to resist deformation and enables it to retain its shape after being stretched. This helps the player to make an accurate shot with full energy swing. It also has the round shape head which improves the load distribution during the shuttle impact. The cross-section of this ratchet frame has the box type profile that ensures this product always feels solid and comfortable. The round shape head also enables you to make a perfect shot. Yonex Carbonex 7000 EX will be the next good racket for beginners. If you have a little skill then it will be a good weapon! One of the main features that make the Yonex 80 E Tune is the E- tuning technology that allows you to adjust its weight by use of weighted grommets. It gives you the ability to customize the racquet’s power to suit your preference. The head of this racket is isometric; square, with a large sweet spot for better accuracy and more powerful smashes. A T-shaped joint covered with graphite at the part where the frame meets the shaft making the racket stiff enough and durable. The shaft of the Voltric 80 is slim to improve its aerodynamics, creating swings that are fast, and smashes more powerful. 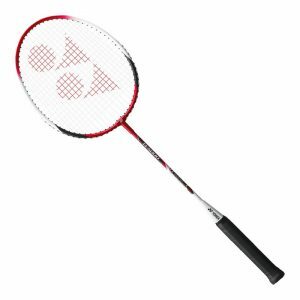 Yonex Voltric 80 E-Tune – Attack racquet, 4U for the average good hand, 3U for the strong hand. Target your hands exactly how and choose the right Voltric 80 Etune weight. Yes! It is an expensive racket, but you will find it worth the money! The progressive beginners will search for this racket. It have an oval head shape which ensures the player getting control and feelings of the shuttle shock. Wilson Strike also has a stiff and balanced light head which makes the handling easy. It usually comes with the strung and composite t-joint which helps to improve the durability of this product. It has a PU grip which offers protection and optimizes the sweat absorption. This model also comes with the head cover and is ideal for the experienced players. This is a great racket for beginners or for kids! How to buy the best badminton racket for each person? Consider the criteria below for selecting racquets. For beginning and intermediate players, choosing the best quality racket goes a long way in enabling you to enjoy playing the sport to the fullest. For starters, it is worth noting that there are different specifications and features of these rackets. As such, you need to know what to look for in the best badminton rackets. For people who know little about these rackets, they end up purchasing the most expensive rackets which may not necessarily be of high quality. The U-value on a badminton racket is the weighted symbol of the racquet. You can often see on the badminton racket parameters such as 3U, 4U, 5U … The larger U is the lighter racket, the 2U racket weighs about 90-94 gr. The 3U racket weighs about 85-89 gr and 4U weighs 80-84 gr. The weight of a racket determines the power given by the racquet when it hits the shuttlecock. Therefore, when comparing the two rackets, it is advisable that you choose the heavier racket. However, heavy rackets are usually difficult to maneuver and often cause fatigue on the arms and shoulders. Therefore, when choosing the right racquet on the basis of weight, it is crucial that you opt for a racket that does not feel too heavy to hold comfortably in the hands. Most of the high-end badminton rackets weigh between 70 and 100 grams. Beginners should opt for rackets that are fairly light for easy control and handling. On the other hand, heavy rackets are especially ideal for seasoned players as they enable the players to add more power to their hits and swings. Badminton rackets come in different forms of flexibility ranging from flexibility, stiff, medium stiff and extra stiff. When buying the most ideal racket for you, you need to consider your swing’s speed. Because the racket’s stiffness is proportional to your swing speed. An overly flexible racquet does not recoil fully when hitting the shuttle and hence the energy used in flexing and swinging the racket is essentially lost. On the other hand, an excessively stiff racket will not flex sufficiently when swinging to hit the shuttle and hence does not contribute to any additional power. During practice sessions, you can consider using flexible rackets to improve your control skills as well as enhance the ability to aim the shuttle to your opponent. Stiff and extra stiff rackets are ideal for players participating in competitions and tournaments as they help in channeling all your energy towards hitting the shuttle; no energy is lost. The tape weight of badminton rackets is divided into 3 categories: heavy head, light head and balance. They are written somewhere on the racquet body. Head heavy racquets give you the extra power when hitting a smash as the head weight contributes to the momentum of a players swing and gives them more power in their shots. The downside is that with a heavier head, your reaction to defensive play will be slower than a lightweight racquet. The added head weight will also be taxing on your wrist when hitting quick drives and defensive blocks. Head light racquets will give you the upper hand when engaging in fast drive exchanges. A lighter head gives players the ability to quickly react to shots, heightening their defensive abilities. A downside to a lighter head is it will take away your energy to create powerful smashes but you will have better control and placement of your half smashes with a quick flick of the wrist. Even balanced bats are in between the other two types. They are quite versatile in that they can still pack a punch when smashing and be quick enough to react to defensive shots. Therefore they can be suitable for different types of players, especially players with a comprehensive play. Another crucial aspect worth considering when choosing a badminton racket is the type of badminton game you want to play. If you regularly participate in single matches, then you own a heavy racket. Because, in single matches, the power factor will take precedence over the speed factor. Therefore, the racquet that produces the strongest smashes will be given more priority to use. Consequently, if you are opting for doubles, then you should choose lighter rackets so that you are able to keep up with the speed and pace of other players. Press your arm against the racket’s strings to test their tensions. Ideally, the strings should sink to a maximum of 1mm sunken depth. Any depth greater than that may imply that the strings are not strong enough and hence do not possess the right tension. It is worth noting that tension standards vary from one region to the other depending on factors such as temperature. For players living in regions with extremely high temperatures, it is recommendable to settle for rackets with high tensions. For players in extra hot regions, the right rackets to purchase are those with the highest tension of less than 1mm sunken depth. This is so that the strings do not stretch too much when playing. For people in relatively cold regions, rackets with lower tensions can still be used as the stretching of strings due to heat is minimal. How is the tension of the racket suitable? Normally, new players, badminton players such as public servants or students, and weak wrists, should choose between 20 and 23 lbs (9 – 10.5 kg). Those who work in heavyweight and good wrist force should stretch the racquet from 23 to 24 lbs (10.5 – 11 kg). For badminton players at the professional level, it is usually preferable to use a racket of> 24 lbs (>11 kg), depending on the level and wrist strength of the individual. One thing to keep in mind is that if the bridge is stiff, the fly is slow and feels like holding a log, you should reduce the tension to about 1 lbs (0.5kg) to fit your hand. In addition, to play badminton you should have special exercises for your wrist. The two main factors that affect a racket’s grip are size and type. There are two grip types: synthetic and towel grips. Towel grips are soft and absorb sweat. As such, they are susceptible to accumulate bacteria and germs. Therefore, it needs to be replaced over time. Synthetic grips are less messy and slick but are not as comfortable as towel grips. This discomfort is due to the synthetic material of the grip not absorbing the sweat when you play. The size of the grip also determines the comfort that you will have in the hands when holding the racket. Players who prefer tight feel for more power generation should settle on big sized grips. The right grip to settle for is dependent on a players’ preferences. This is because there are those players who feel comfortable and relaxed when using rackets with synthetic grips while others prefer towel grips. However, for competitive playing, it is advisable that you use the towel and big sized grips for powerful hits. 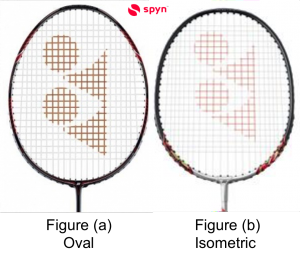 Badminton racket heads come in two shapes: oval and square shapes. Square shaped rackets tend to have a large surface area while oval rackets, on the other hand, have concentrated power. Therefore, you should choose the type of racket head that favors your playing style. It is important to note that the type of racquet you settle for will have a great impact on your playing style and experience. For beginners and intermediate players, rackets with square shaped heads are ideal for them as the large hitting surface enables them to hone their playing skills. Oval shaped rackets may also be suitable for pro-players who are keen on outshining their opponents by concentrating their hitting power thereby producing powerful hits. However, there is a need to be careful about the type of racket you are choosing on the basis of the shape of the racket head. Because, with inexperienced players, when using a racquet with an oval head will become difficult to control when making strong hits. If you are keen on becoming a professional badminton player, you should opt for rackets made using carbon-fiber materials. This is because the material is not only extremely light but also possesses great aerodynamic features. In line with this, it is ideal for use in competitive playings such as in leagues and tournaments. Other materials used in making these rackets include lightweight aluminum and steel. Each of these materials has varying features, pros, and cons. As such, you should research the material that suits your playing needs in the best way possible. It does not make any financial logic to purchase expensive badminton rackets for hundreds of dollars while you can purchase other good quality ones for as little as a few tens of dollars. You should use a budget to guide you on the most affordable racket brand to purchase. Avoid purchasing rackets whose prices are on either excess (whether too high or too low) as those rackets can be too expensive for you or are of excessively low quality (for cheap brands). However, not all cheap racquets are thrown away, there are also rackets that cost less than 100 but are of good quality. OK! After you’ve got a good badminton racket. You should train hard to improve your playing skills. You can play in the backyard or on the beach with your family or you can play in the badminton club’s indoor court. Take your time to analyze your strengths and weaknesses to consolidate and overcome them. You can hire a coach to train you or play alongside experienced players to polish your playing skills. This increases your chances of learning how to play the badminton at a faster rate. Finally, Hope you find this tutorial of mine helpful. Please refer to my article about shuttlecock, net, and a pair of shoes.